Old school RTS with a modern twist. Immersive stone age setting with different environments. Hunt wild dinosaurs or use them as mounts for your units. Bring forth powerful abilities ranging from thunder bolts to meteor showers and rain death on your enemies. Shape your tribe and chieftain with powerful talents. Intensive multiplayer with players competing against each other or play cooperative against AI. Create massive armies and fight to control resources. Beta Patch 0.9.20: The new Char! A 2nd Faction! When one of your units dies or kills an enemy unit, a Zombie spawns near Char. These Zombies are weak but do not take up population space. Limited to 10 Zombies. Power Hungry: Slowly generate Power Points. All units receive +1 Regeneration. Unholy Allegiance: Units train 10% faster. Receive a free Zombie every 30 seconds. Overpower: All units receive +5 Armour Penetration. All units deal 25% extra damage against Buildings. Master of Death: Increases the maximum amount of Zombies you can have to 15. Zombies receive +1 Regeneration. Bloodthirst: All units gain +5 Damage and +1 Movement Speed. Go’n Teachings: Golems are 25% cheaper. Zombies receive +50 Health. Ancestors: Instantly receive 3 zombies at the target location. Can exceed maximum capacity. Cannibalize: All units heal for 5% of their maximum Health when they attack. Rally: Doubles production speed for all buildings for 10 seconds. Warcry: All units gain 25% extra damage and move 10% faster for 10 seconds. Death Claws: Creates a small area of grasping hands, dealing 20 damage every second and slowing enemy units within. Lasts 10 seconds. Settlement: Your home base. Provides population and increase your maximum population cap. The Chieftain can be trained here. Minions can be trained here, which construct buildings and gather resources. Serves as a drop-off point for resources. Storage Pit: Drop-off point for resources. Farm: Can be worked by Minions to produce Food. Burial Grounds: Char’s primary unit production building. Allows training of Bone Adepts and Blowdart Gunners, as well as upgrades to Lacerating Bone Adepts and Toxic Blowdart Gunners. Shaman Cave: Building that produces Shamans. Also heals nearby units. Witch Doctor Hut: Cursed tree that produces Fire and Frost Elementals. Also allows you to train Witch Doctors at Tier 3 Settlement. Go’n Forge: Ancient forge where Golems are produced. Bone Tower: Defensive structure that fires arrows at nearby enemies. Go’n Generator: Slowly provides Power Points. Fertility Totem: Gives +10 population. Crystal Camp: Allows you to train Crystal Burdened to send to your Settlement to generate crystal. Minion: Char’s workers. Gathers resources and constructs buildings. Bone Adept: Fanatical Infantry unit. No Armour but starts with higher Damage and Armour Penetration. Good against Beast units. Blowdart Gunner: Tribal Ranged unit. Good against Infantry units. Lacerating Bone Adept: Upgraded Bone Adept. Heals for 2% of their maximum Health when they attack. Toxic Blowgunner: Upgraded Blowdart Gunner. Afflicts targets with Toxins, which reduce incoming Healing and Regeneration. Shaman: Healer unit. Heals wounded units with a splash effect that also slightly heals nearby allies. Fire Elemental: Ranged unit with very long range. Good against Infantry and other Ranged units. Ice Elemental: Tough Infantry unit that slows down nearby enemies. Good against Cavalry units. Witchdoctor: Powerful Ranged unit that deals Area of Effect damage. Good against Infantry units and large groups of enemies, but vulnerable. Golem: Powerful siege unit. Good against Buildings and Armoured Units. Zombie: Weak unit that does not take up population space. Spawns when Char’s “Necromancy” bonus is triggered. Crystal Burdened: Undead unit that walks between the Crystal Mine and the Settlement to produce crystal. Mika also received some changes with the new Talent system and Chieftain bonuses! Mika’s excellent leadership skills makes Villagers 25% cheaper and construct buildings 25% faster. Big Game Hunting: All units deal 25% extra damage to Wild Dinos. Barracks are 25% cheaper to construct. Mystic Healing: All units receive +2 Regeneration. Medics are 25% cheaper. Master of Beasts: Units in the Stables are 25% cheaper and train 10% faster. Natural Selection: All units gain +5 Damage and +5 Armour Penetration. Frenzy: All units receive +1 Movement Speed and return 3 Damage on hit. Vision: Reveals an area of the map for 10 seconds. Lightning Bolt: Deals 250 damage to a unit and stuns them for 3 seconds. Harvest: Villagers gather and build 25% faster for 15 seconds. Bulwark: All units receive +10 Armour and +1 Regeneration for 10 seconds. Meteor: Showers an area with meteors, dealing 33% of their maximum health in Damage after a 2 second delay. Settlement: Your home base. Provides population and increase your maximum population cap. The Chieftain can be trained here. Villagers can be trained here, which construct buildings and gather resources. Serves as a drop-off point for resources. Storage Hut: Drop-off point for resources. Farm: Can be worked by Villagers to produce Food. Barracks: Mika’s primary unit production building. Allows training of Warriors and Archers, as well as upgrades to Fire Warriors and Poison Archers. Medic Hut: Building that produces Medics. Also heals nearby units. Stables: Training ground for Beast units. Allows training of Triceratops Rider and Sabertooth Archers. Also allows you to train War T-Rexes at Tier 3 Settlement. Berserker Hut: Allows training of powerful Berserkers and Axe Throwers. Watchtower: Defensive structure that fires arrows at nearby enemies. Trade post: Allows you to train Stegosaurus Caravans to send to your Settlement to generate crystal. Villager: Mika’s workers. Gathers resources and constructs buildings. Warrior: Armoured Infantry unit. Good against Beast units. Archer: Ranged unit. Good against Infantry units. Fire Warrior: Upgraded Warrior. Inflicts damage over time to enemies they hit. Poison Archer: Upgraded Archer. Inflicts damage over time to enemies they hit. Healer unit that heals wounded units. Cannot attack. Triceratops Rider: Armoured, tough Beast unit. Good against Ranged units. Sabertooth Archer: Ranged unit mounted on a Beast. Good against both Infantry and Ranged units. War T-Rex: Powerful unit that excels against buildings and Armoured enemies. Berserker: Powerful Infantry unit. Good against Beast units. Axe Thrower: Powerful Ranged unit. Less range than Archers but higher Damage and Armour Penetration. Good against Infantry units. Stegosaurus Caravan: Unit that can be sent to the Settlement to generate Crystal. AS ALWAYS, WE HIGHLY RECOMMEND RESETTING THE DEFAULT KEYBINDS AFTER EACH PATCH. New hotkeys have been added for the new buildings and units. Default key for “Zoom In” and “Zoom Out” has been reverted to the “Scroll Wheel”. Selection box dragging will now select buildings if the selection only contains buildings. Otherwise it will only select units. Fire Warriors only deal extra Damage over Time to a unit they’re attacking. Zombies health reduced from 100 to 50. Zombie damage reduced from 10 to 7. Zombies no longer take up population space. Zombies can no longer be trained at the Settlement. Fog of War settings have been added to the lobby. Fixed an issue where Ranged units would not use their maximum attack range to find targets during an attack move. Fixed a localization error where “Upper HUD” and “lower HUD” were swapped in the Dutch translation. Fixed a bug where upgrading the Settlement would remove the white Blueprints and caused Villagers to stop when they arrived. Fixed a bug where Villagers would attempt to drop off resources even if they had none after completing a farm. Fixed a bug where villagers could occasionally get stuck on each other. The stop command will now remove building blueprints from Villagers and refund the resources. We’ve revamped the priority system again to use basic values rather than unit types. This gives more performance and flexibility. We will closely monitor this system as production continues. Various Units have been retextured to show the team colours more clearly. The Ice Elemental has received a new particle effect for their slowing aura. The Medic behaviour has been tweaked to better react to Attack commands. Stegosaurus Caravans have a slightly faster animation for movement. Their movement speed has been unchanged. With the new faction in place, we can once again focus on requested features and fixes. We also want a lot of feedback regarding balancing of the new faction. Rest assured that we have not forgotten the feedback we received previously and we will still implement these improvements along the way. We're working on polishing the animations as we decided to push this faction forward so we can gather feedback more quickly and spent a lot of time of getting the mechnics and features working. Kind Regards and a big thank you! The game now supports Mac OSX ! 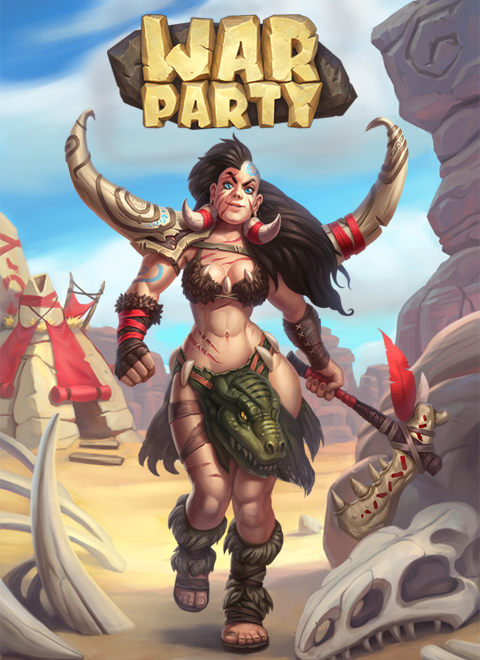 WARPARTY Beta Patch Notes 9: The great UI overhaul!